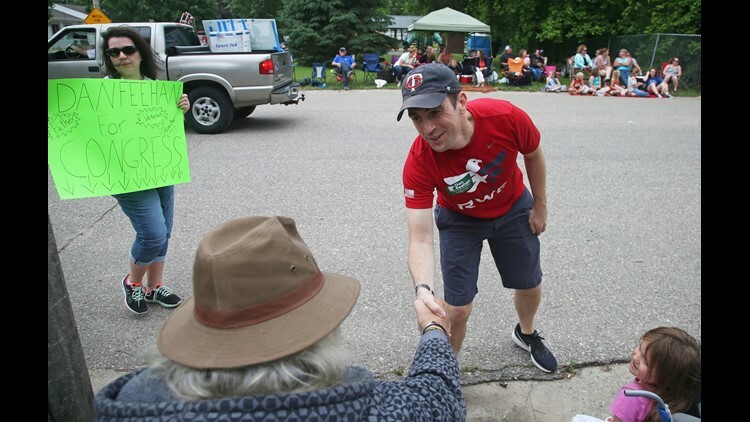 In this June 10, 2018 photo, Minnesota 1st District congressional candidate Dan Feehan works a parade in Waterville, Minn. Waterville's 54th annual Bullhead Days parade included Democrat Feehan and Republican Jim Hagedorn, candidates who came to shake as many hands as they could in the open seat race which promises to be one of the most closely watched races in the country. On Oct. 4, USA TODAY published a breathtaking economic profile of all 50 states, ranked by household income. Embedded within it is arguably the greatest unseen political truth of our time. Fathom it, and you will see how politics may unexpectedly affect economics and wealth for years to come. Though income drives the rankings from poorest (West Virginia) to richest (Maryland), the list also includes population, unemployment and poverty rates. To unlock the political secret in these data points, cross-reference them with figures available from the National Conference of State Legislatures (NCSL) showing which party controls state legislatures. What you see is exactly the reverse of our cultural mythology: Heading into midterms, Republicans are very much the party of the poor and Democrats are the party of the rich. This seemingly sounds nuts. It isn’t. Thirty-two states have Republican-controlled legislatures. Eighteen of the 19 poorest states have legislatures where both chambers are Republican controlled. New Mexico (46th richest, fifth poorest) is Democratic. But there isn’t another blue or purple state until you get to purple Maine (31st richest, 20th poorest) with its “split” legislature of one party in each chamber. All the states in between (such as Tennessee and Florida) are Republican, both chambers. So is Michigan, where Republicans hold all high state offices (where Donald Trump won in 2016). Above New Mexico, you jump all the way to middle of the pack Vermont (27th richest, 24th poorest) to find a state with both legislative chambers held by Democrats. But all five richest states have both legislative chambers controlled by Democrats – Maryland, New Jersey, Hawaii, Massachusetts and Connecticut. Overall, Democrats dominate the 20 richest states. Conventional wisdom has long proclaimed Republicans the party of the rich and Democrats the party of the poor! Forty years ago that was largely true. The poor almost everywhere elected Democrats. That is how most media portray it now. But media are almost solely big-city based, where the conventional wisdom remains true. Democrats are the party of the urban poor – from Boston to Los Angeles. But at the grassroots level, overall, it isn’t so. Republicans, overall, own America’s low-to-no income vote. Media simply don’t report what they don’t live in and see. This might seem academic – pure sociology – but it isn’t. It’s a central money issue. November’s vote is a timely re-test. Will poor voters reverse this trend and by how much? I don’t know. No one analyzes or polls for this. If America’s poor states remain Republican at the bottom, so will our Electoral College and the Republicans’ growing ability to win the presidency and control the Senate with a minority of the national popular vote. If a big blue wave also wins back many poor-state legislatures, then 2020 may introduce a new wave of Democratic economic and social principles – via Democratic presidents and Senates. It will determine whether we see more regulation or less. Or more or fewer federal programs, and all the other things the two parties see so differently. The balance of power in electing presidents and controlling the Senate lies in the hands of our poor, largely our nonurban poor. You tell me. Will the Republican Party nationally remain the party of the poor at the grassroots level? Or will Democrats regain that mantle they held long ago? The outcome determines two very different economic and money policy futures for America. Stay tuned. I’ll report that grassroots outcome next month.